Is your car's engine making a strange noise? Perhaps you've heard a 'twang' come from underneath the bonnet but haven't been able to find out what made the noise. Let's face it, most of us can change a tyre, check whether the oil level is okay and top up the screen wash, but when it comes to anything more complicated we haven't got a clue. Unless things look drastically wrong underneath the bonnet, minor problems can be missed and turn into serious problems that can in turn lead to expensive bills. Not many garages operate a recovery service like Davy Perfect Autocare, so when your engine is making a different sound than normal, call to book your vehicle in at our garage. Students are famous for leaving university with a huge amount of debt and since the increase in tuition fees, that amount has only risen. 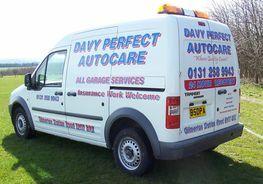 Whilst at university you will want to avoid needless spending wherever possible, which is why Davy Perfect Autocare is the ideal garage to bring your car to as students, as well as OAPs, are provided with a discount. Additionally, a free gift is provided to you if you quote 'website' whilst you are on the phone to us and free estimates are offered to all of our customers. For a garage that can recover your car as well as repair it, get in touch with us today on the number at the top of the page. Alternatively, you can also get in contact with us by filling in the contact form with your details and query.